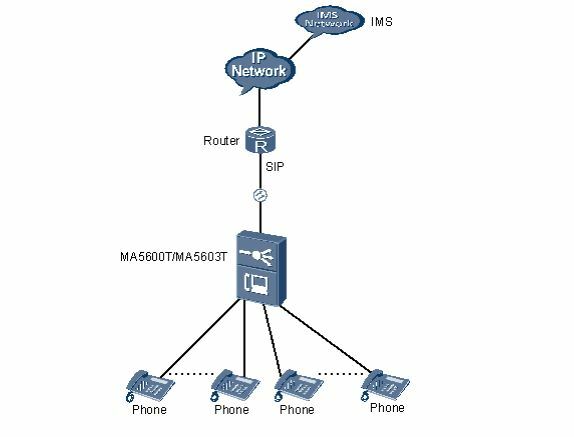 According to the actual network, a route from the MA5600T/MA5603T/MA5608T to the IMS must be configured to ensure that the MA5600T/MA5603T/MA5608T and the IMS are reachable from each other. Electronic switch 0 must be in location-1 (indicating that the system goes upstream through only the upstream board). Electronic switch 1 must be in location-0(indicating that the VoIP service is supported). For details about how to configure the electronic switch, see electro-switch. The SCUN and SCUH control boards do not support electronic switch. The control board SCUL does not provide the upstream port and the system goes upstream through only the upstream board. Configure standard VLAN 20 as the media and signaling upstream VLAN, add upstream port 0/19/0 to the VLAN, and configure the IP address of the Layer 3 interface to 10.10.10.10, which facilitates the configuration of the media and signaling IP address pools. Add the IP address of the VLAN Layer 3 interface configured in the previous step to the media and signaling IP address pools respectively, which facilitates the selection of media and signaling IP addresses used for the services from the IP address pools. According to the data plan, IP address 10.10.10.10 is added to the media and signaling IP address pools, and the gateway IP address corresponding to the media IP address is 10.10.10.1. You can configure the attributes of the H248 or MG interface only when the media IP address and the signaling IP address exist in the media and signaling IP address pools. The media IP address and the signaling IP address can be different. You can plan the IP addresses according to the actual network. call connection through the SIP interface. According to the data plan, add SIP interface 0, and configure the interface attributes. Step 4: Configure the ringing mapping of SIP interface 0. Configure the user ringing mode. The break-make ratios of the cadence ringing and the initial ringing are both 1:4. Therefore, the value of parameter cadenceis 0, and the value of parameter initialringis 4. Step 5: Enable the SIP interface. Reset the SIP interface to make the SIP interface register with the IMS (or to make the attributes of the SIP interface take effect), so that the SIP interface can work in the normal state. After the SIP interface is interconnected with the IMS, the SIP interface should be in the normal state, indicating that the SIP interface can work in the normal state. a. Configure the PSTN user data (Phone 0-Phone 63) in slot 0/2. b. Configure the calling priority of the PSTN user in port 0/2/0 as Cat2. c. Configure the PSTN user data (Phone 64-Phone 127) in slot 0/3. d. Configure the authentication data of the PSTN user in port 0/2/0. Considering users safety, the IMS may require user authentication. You can run the sippstnuser auth set command to configure the user authentication data, including user name, password mode and password. The authentication data should be consistent with that of IMS side. e. Configure the PSTN user type in slot 0/3. Configure the PSTN port in slot 0/3 so that the port supports the polarity reversal. After the interface data and the PSTN user data corresponding to the SIP interface are configured on the IMS, check whether the VoIP services can be provisioned normally. In the normal state, users of Phone 0-Phone 127 can communicate with each other successfully. The calling party can hear the dialing tone after picking up the phone. When the calling party dials the phone number of the called party, the phone of the called party can ring normally, and the calling party can hear the ring-back tone. The calling party and the called party can communicate in the normal state. After the called party hooks on, the calling party can hear the busy tone.